Rockaway, N.J. – Fette Compacting America, the leading supplier of tablet press equipment for pharmaceutical and nutritional applications, has introduced the FEC20 Capsule Filling Machine, capable of producing up to 200,000 capsules per hour. Originally unveiled at the Achema 2018 trade show in Germany, the latest in Fette’s FEC line of capsule fillers is now available to the North American pharma manufacturing marketplace. 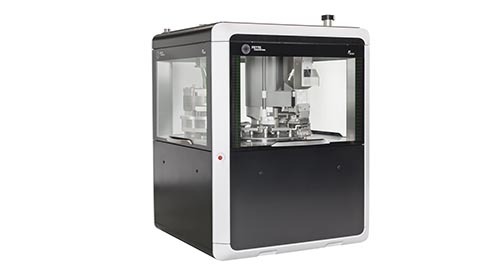 Derived from the proven technology of its predecessor, the FEC40 – which, at a maximum output of 400,000/hour, is the world’s fastest capsule filler – the FEC20 can produce up to 200,000 capsules/hour, making it ideally suited for medium-sized batches. While the FEC40 features Fette’s patented dual capsule filling process, the FEC20 decouples this mechanism to offer a single capsule filling and discharge station. Due to the similar technology of the FEC20 and FEC40, the two machines are able to function in concert with one another easily, and even use the same format parts. Additionally, both machines are capable of controlling and monitoring each step in the capsule filling process. The FEC20 features a patented tamping pin station assembly system enabling users to rapidly change dosing methods, products and batches. Pre-fitted tamping pin stations allow for readily accessible production without extended time required for preparation. Up to three pellet stations can be installed in the machine. Another commonality with the FEC40 is the FEC20’s HMI. The machine’s interface features an intuitive 19” touchscreen, optimizing accessibility and facilitating workflow. The user interface offers a permanent overview of all process and quality parameters, and automatically analyzes each entry to ensure consistency. This interface is also found in other Fette equipment, including its FE Series of tablet presses, supporting the company’s emphasis on ergonomics and efficiency. The system also continuously measures the filling levels of all capsule and product containers during production and offers relevant analytics. Extensive rights management enables certain functions to be assigned to various users, and a comprehensive event log allows for evaluation of each step along the production process.